After inheriting a highly specialised - and highly peculiar - medical practice, Dr Helsing spends her days treating the undead for a host of ills: vocal strain in banshees, arthritis in barrow-wights and entropy in mummies. Although barely making ends meet, this is just the quiet, supernatural-adjacent life Greta's been preparing for since childhood. 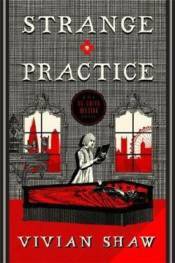 But when a sect of murderous monks starts attacking Londoners, undead and human alike, and terror takes hold of the city, Greta must use all her unusual skills to keep her supernatural clients - and the rest of London - safe. STRANGE PRACTICE is the start of an exciting contemporary fantasy series.